My vampire wife came home the other day, let the dogs out for their potty break, and then found this on the back porch when she went to let them in. That’s dirt. Quite a lot of it actually. 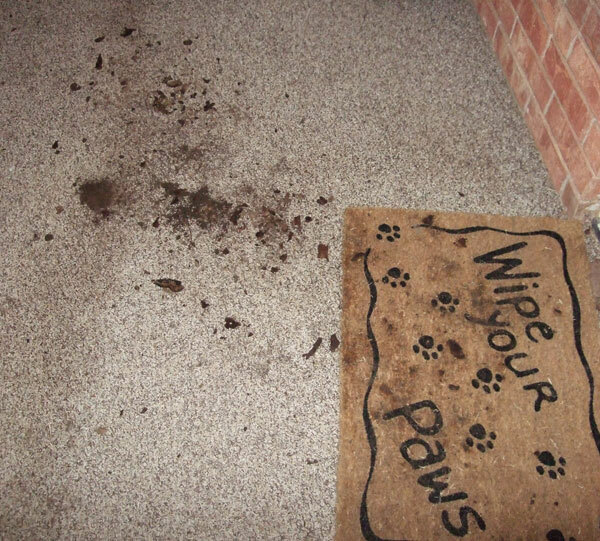 Notice the “Wipe Your Paws” door mat? 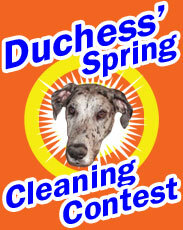 Yeah… I think Duchess is mocking us. Duchess evidently found something reeeeeeeally interesting underground and decided it was a good idea to excavate it and bring some of the evidence to the door in an effort to raise our awareness. Because, you know, it could be something really cool – like a bone, an old soda can, or Jimmy Hoffa. We got home from obedience class and I went out to take pictures of the new landscaping she’d decided to perform. It was pitch black so I didn’t really know what it was that she was after, but I took a picture anyway. She stuck her giant shnoz in there just as I was snapping it. She obviously thought this was being submitted to the “Dog Archaeology Journal” or something. 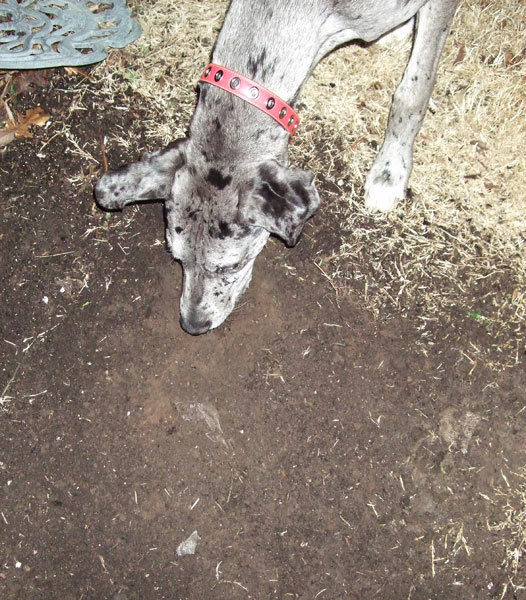 I didn’t see anything but a hole, but as I got inside and started downloading the photo I saw what it was she’s after. If you look closely in the middle of the pic you’ll see a little bit of plastic – like the kind that is wrapped around something for shipping. Yep – the big “treasure” she’s after is a discarded piece of plastic that somehow got under the surface by our back porch. Why is an old piece of plastic wrap so intriguing? Your guess is as good as mine. My theory is that she’s gone “green” and is currently excavating it in an effort to recycle. Let’s hope she never finds out there’s a bunch of old pipe buried throughout the yard that used to be a geothermal heating and cooling unit for the house. That escapade might skip the “Dog Archaeology Journal” and put her straight on a milk carton. Duchess– your hooman cracks me up….Ha Roo!! What does he do in real life? He’s a boring manager/salesperson. His dry wit and uncanny sense of comedic timing don’t really come in handy there. LOL Luke loves to dig too but for some strange reason he will only do it down at the playground/park we go to everyday. I think it’s because it’s sand and it’s much more fun to dig in, although he’ll dig in the snow too. He also loves plastic, and paper. ANYTHING papery is grabbed up as soon as he sees it in this house lol. Auw..what is she doing at the bottom picture?eating?